Before departing from Grendich Courthouse, I made sure that I was fully prepared for what lay waiting for me in the Diessa Lowlands. You see, I have heard a lot bad things about this area. 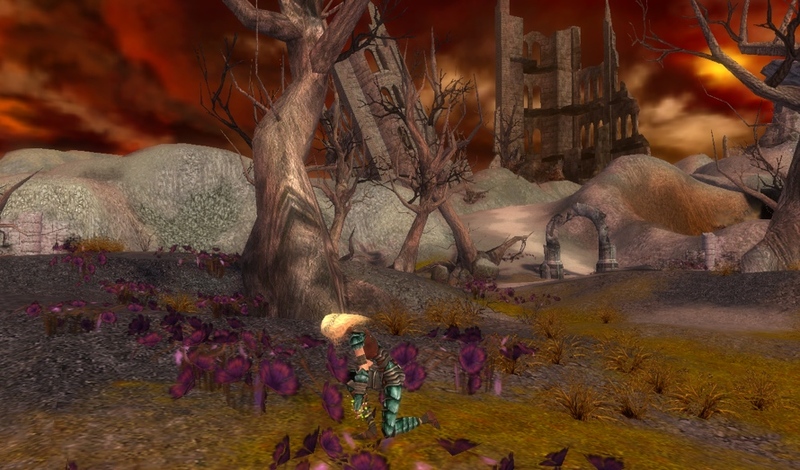 First of all it is a huge area, and on top of that it is filled with hundreds of hostile creatures. Secondly, it is very easy to be spotted by multiple patrolling enemies at once. After finding out what sort of monsters I will be fighting and their general tactics, I setup my own plans on how to fight them and set out into the Diessa Lowlands. Today’s exploration starts from the outpost, Piken Square. Before venturing out I had a good chat with the folks inside to learn about the area. Firstly, they suggested not exploring it at all… because the charr are too dangerous. Secondly, that if one were to venture out that I should be very well equipped. Once I set foot outside, I immediately spotted some charr next to these interesting purple flowers. After taking care of the charr, I knelt down to inspect the flowers. They are quite lovely, but you cannot pick up their scent at all. The air is filled with the smell of death and decay. It’s moments like this when I begin to understand how Ascalonians must feel. For this expedition, I’m starting from the Ruins of Surmia. I thought about leaving from the Frontier Gate, but I really wanted to get the grawl out of the way first. To make things easier, one of my sidekicks knew a curse known as Spinal Shivers and I used arrows enchanted with cold magic. 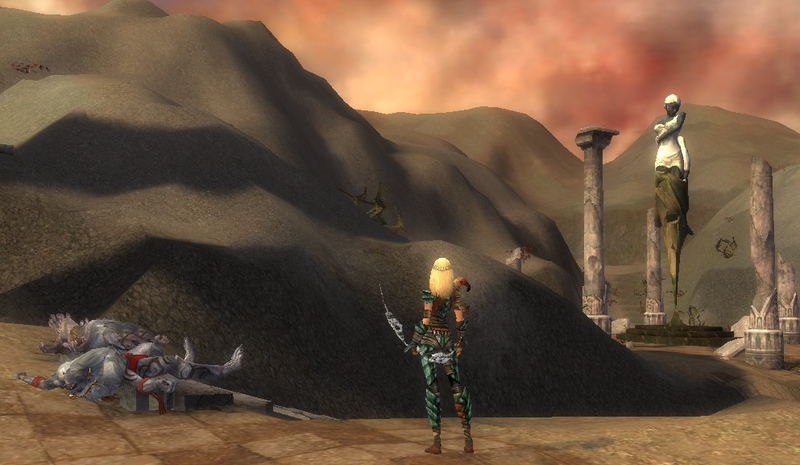 Anyhow, shortly after entering the Eastern Frontier I spotted a statue of Lyssa amidst patrols of grawl. The statue itself is in good condition even though the surrounding pillars are not. I wonder who takes care of these statues anyway. Perhaps they are protected by the gods themselves. Starting from Serenity Temple, I continued on into Pockmark Flats. Here, the most distinguishing features are the mass amounts of crystals that rained down from the Searing. When traveling through here, you will never lose sight of these. Even though they came about from a catastrophe, I find them beautiful.